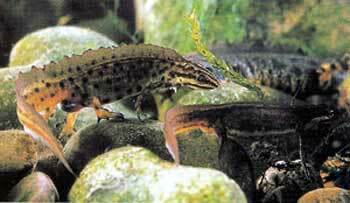 The smooth newt is very similar in size and appearance to the palmate newt, males and females 6 to 9 cm. Fingers and toes are not webbed, but in the males case the fingers and toes develop frills in the reproductive period, the body colouration is greenish brown with glints of yellow, red or violet and marked with dark spots which are lighter and more speckled for the female. The belly is light cream and has a red or orange band running down the centre with black spots; the underside of the chin is usually speckled. During the breeding season the male develops a wavy crest which runs from the back of the head to the tip of the tail. Male and female are more of a dull brown in terrestrial phase. Male and Female Smooth newt in reproduction period. 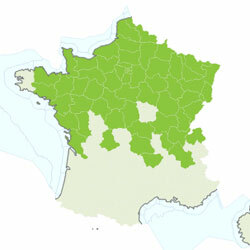 In France they are only to be found in the northern half of the Country. The smooth newt makes use of a large range of different water types and qualities, ponds, lakes, ditches, canals, marshy pools and some inland coastal saline waters. Unlike other newts it often spends little time on land, when it does it lives in woodland debris and semi composted matter where it eats worms and slugs, hibernation is in cavities in the ground, under tree roots etc. In its aquatic habitat it eats all types of water insects, their larvae and eggs. 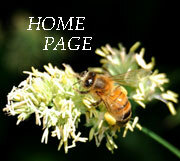 Reproduction starts from late March and continues until mid May. A female deposits around 200 eggs at a rate of 10 a day which are placed singly on leaves of aquatic plants, these take about 4 weeks to hatch and metamorphosis can be anything from 40 to 275 days, some therefore hibernate in the water and complete metamorphosis the following spring. Sexual maturity is 2 to 3 years and lifespan is around 10 years. Not one of the more threatened newts but fully protected in France with a need for continuous population monitoring - Fully protected species.